Surrounded by neat ranks of cast iron printing presses and the smell of resin, bitumen, grease and ink, Michael Kempson’s office reminds me of a Merzbau. I can’t see the walls for books and towers of steel drawers, and it takes Kempson a minute to clear me a seat wedged under an overhang of cardboard. I think there’s a desk in here somewhere, but the University of New South Wales Australia’s convenor of printmaking studies doesn’t strike me as man who sits still for very long. His father was an Anglican minister, and he is quick to suggest that he is something of an evangelist for the social and educational value of printmaking. 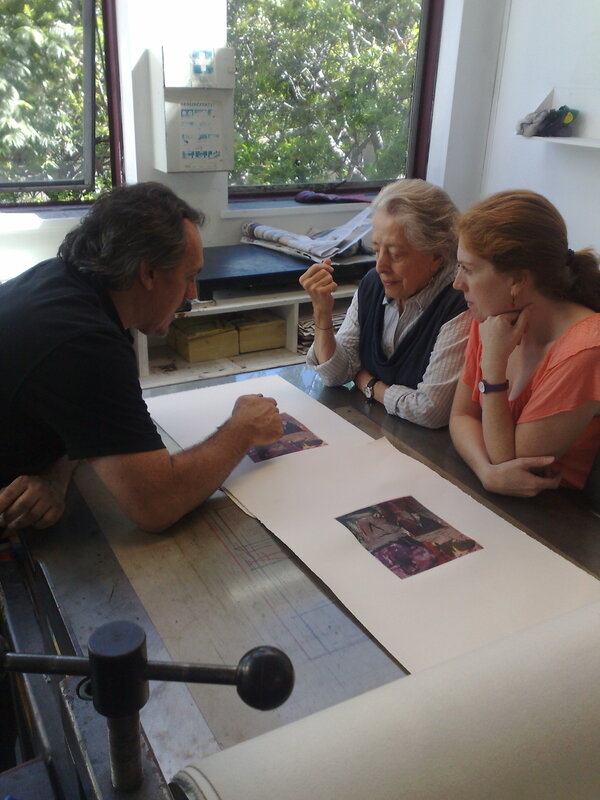 UNSW Art & Design teaches etching, relief and lithography; centuries-old techniques in which each print is handcrafted and unique. Editioned prints have been part of the vocabulary of Western art since the seventeenth and eighteenth centuries. Goya, Toulouse-Lautrec, Matisse and Picasso used etching and lithography to produce works that could be seen and owned by a middleclass public. But since the second half of the 20th century, digital and photographic technologies offer increasingly easy ways to distribute images. Printmaking departments all over the world now have to fight for their place between one-off art objects and a global culture of digital media, photography and video. Kempson draws a parallel between printmaking and jazz music; both are highly technical, experimental, open and collaborative, with a rich tradition of innovation. To the uninitiated at least, printmaking and jazz can also seem arcane, sustained by a core of devotees and a bit out of date. For Kempson though, it is because printmaking is difficult that it tends to be collaborative and workshop based, fostering connections between artists. Unlike the lonely studio, the print room is a space for political, social and artistic exchange. In 2004 Kempson established Cicada Press with a mission to teach and promote printmaking through collaboration. 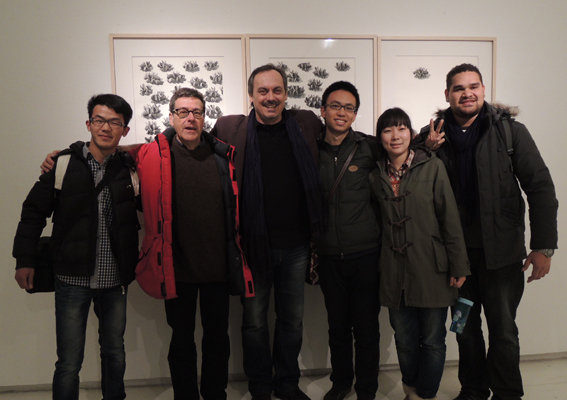 Well-known artists from around the world are invited to UNSW to collaborate with students on an edition of prints. Cicada offers the artists an opportunity to expand their own practices by trying out new techniques, while students learn by being directly involved in a professional artist’s work. In the ego-driven world of contemporary art it is rare to see artists of different generations sharing the creative process, but so far Cicada has worked with over 170 artists to produce over 1300 editions of prints. 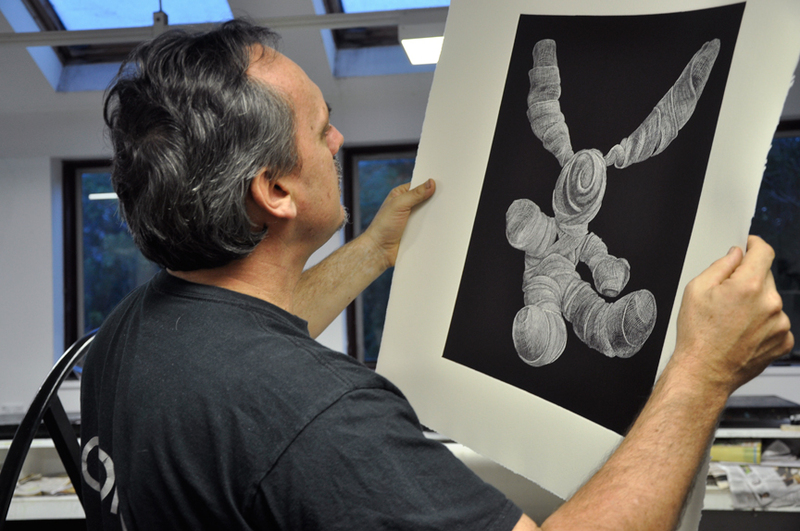 For Kempson; “openness with empathy towards the other is crucial in the collaborative projects at Cicada Press.” Some artists, such as Vernon Ah Kee or Fiona Hall, bring very conceptually rooted approaches to printmaking, while others, such as Elisabeth Cummings or Guy Warren, explore more direct and gestural uses of the medium. This philosophy of generosity and collaboration extends beyond the workshop. 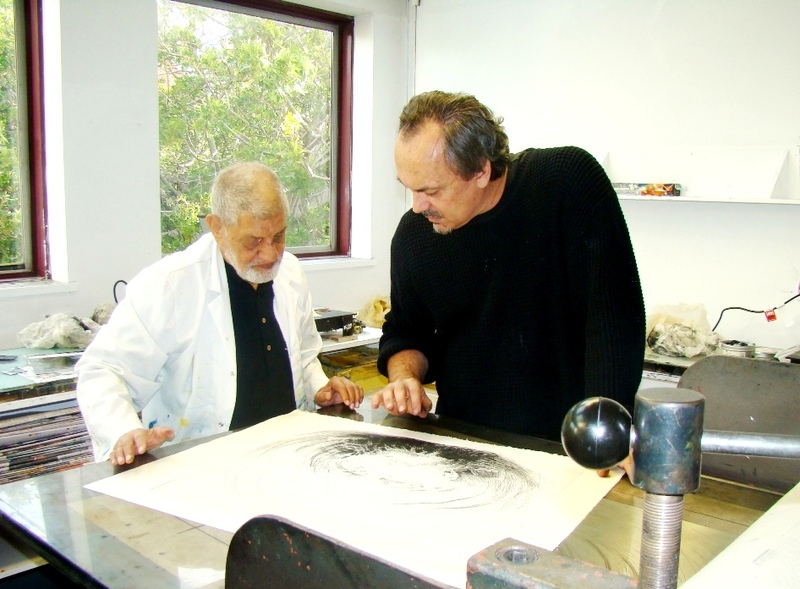 In 2006 Cicada Press worked with artists from the central desert community of Papunya, including Michael Nelson Jagamara, on an edition of prints. Artists came to Sydney and UNSW students visited Papunya to realise a unique exhibition of linocuts and etchings that helped to raise money and awareness for the new Papunya Tjupi art centre. More recently Cicada has participated in exchanges and residencies with institutions in Pakistan, Thailand, Taiwan, Canada, New Zealand, Korea, China and the USA, enabling students and staff to build enduring professional relationships across Asia. In 2010 Cicada took an exhibition of indigenous prints to Karachi, and in 2012 it sponsored a travelling exhibition of Chinese and Australian prints that included artists from Papunya. Michael Kempson is taking his social and artistic ministry, and his students, around the globe. He is changing the way the visual arts are taught and practiced, and perhaps even fostering a more collaborative and generous world in the process. Anthony Springford is a Sydney based artist and writer.